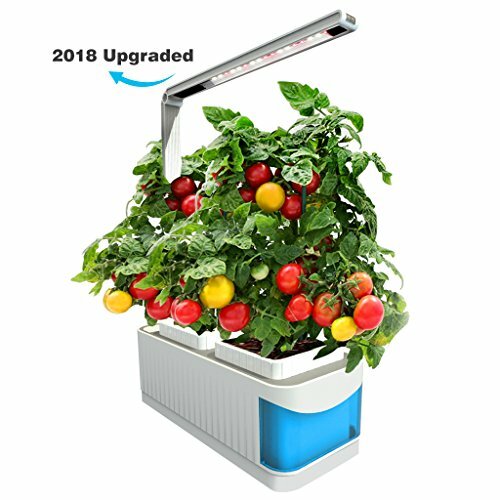 Finether Indoor Hydroponics Gardening Kit takes care of your plants automatically by making sure they have enough water, light and nutrients at all times. Lets you harvest fresh herbs, vegetables, salad greens, flowers and more all year round in this smart countertop garden. 2 water fill holes allows you to add water or nutrients (not included) easily without lifting the growing pots. Not easy to spill water on the countertop. You can easily switch the lighting modes among red light, white light and red+white light or 3 lighting levels of white glow using a button on the lamp head. This Hydroponics Gardening Kit comes with reusable planting medium that offers you a soil-free planting method. No pesticides and other chemical required. It has 7 red LEDs and 10 white LEDs to promote the plants to grow faster even in the winter and have tasting results. It has a 1.5 L water tank that provide enough water for your plants and reduce refilling. See-through window lets you check the water level at a glance. Red light flashes and the lamp will beep twice when the water level is low to reminds you to add water, keeping your plant growing with enough water. It will beep again after half an hour if you are not around, never disturbing your family's life. Wide Usage: You can growing strawberry,tomatoes,flower,lettuce,spinach,peppers and other herbs.